The Cool Bean Company announced their official launch into the UK today with premium retailer, Waitrose following less than one year of trade in Ireland with Supervalu and selected Fresh stores. Cool Beans is a potted, healthy, bean-based meal that comes in three delicious flavours; smokey paprika, original tomato and hot chilli – the latter two of which will retail at £1.99 in 135 Waitrose outlets this week in a 300g microwaveable pot created exclusively for the store. The first fortnight will see both products promoted for £1.49 and can be located in the chill aisle next to prepared salads, coleslaws and quorn range. 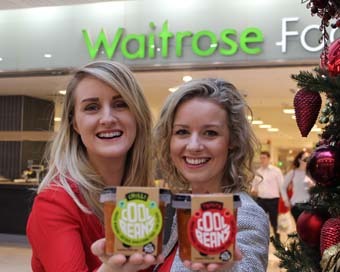 Founded by Corkonian Sarah O’Connor and Tipperary born Isolde Johnson in 2013, the Cool Bean Company aims to create a no fuss, no nonsense, superhero food. Similar to other food brands such as Innocent and Pieminister, the company had its start on the music festival circuit before hitting supermarket shelves in Ireland in September 2014.